We raise two types of chickens here at RindyBerry. Heritage breed layers and pastured meat birds. Each summer we raise about 150 Cornish Rock Cross for processing. This breed was developed specifically as a meat chicken. 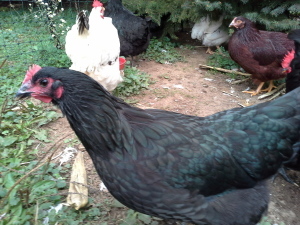 It is a fast growing chicken and larger breasted than other meat bird varieties. 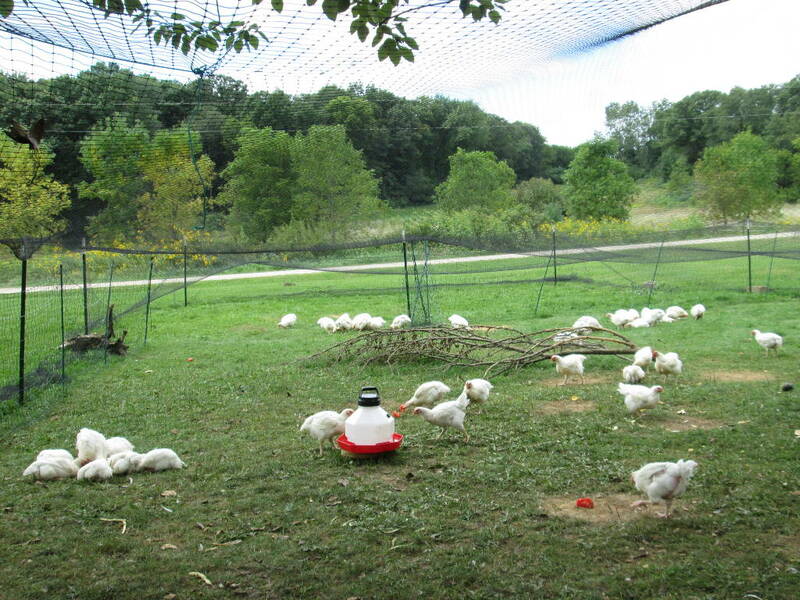 Our meat chickens are pasture raised, having free access to fresh air, sunshine, bugs and goodies from our gardens. 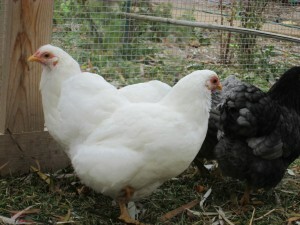 In the fall of 2012, we purchased a flock of laying hens which included a few Bantam Wyandottes. 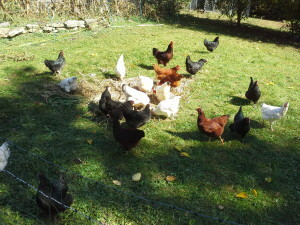 This original flock consisted of both Delaware and Rhode Island Red chickens, two of many breeds considered heritage birds by various poultry organizations. One of the national organizations, American Livestock Breeds Conservancy (ALBC), posts a conservancy list of various breeds and their recovery progress. We use this listing as a guide when researching and selecting our birds. Foraging in the fresh air and sunshine make for happy birds and tasty eggs! 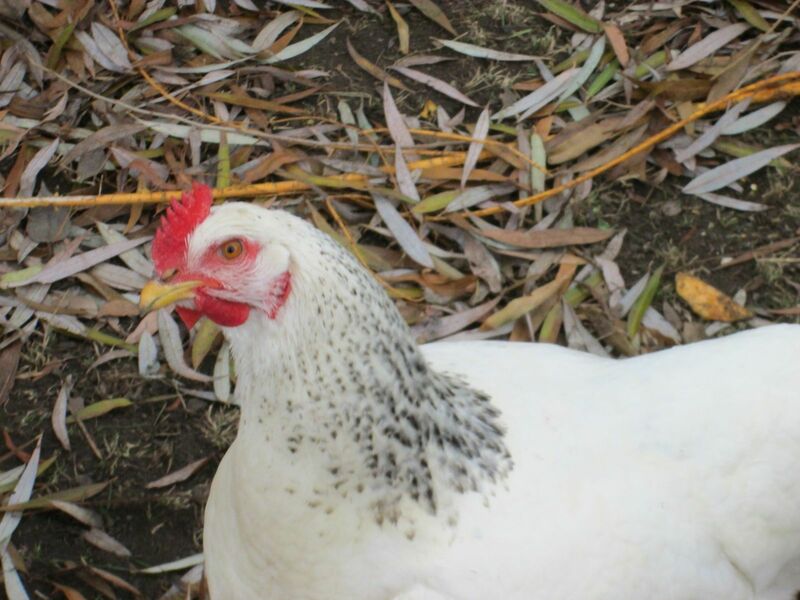 This is considered a dual-purpose breed, meaning it’s a good laying hen and used as a meat bird. Which is handy when your spring hatch turns out to be 80% roosters. 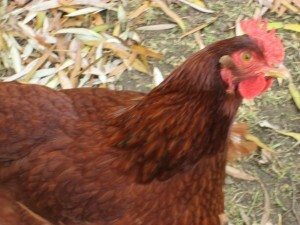 These hens have a good temperament and produce a large brown egg. They also tend to go broody (setting to hatch a clutch of eggs), which is how we increased our flock of Delaware that first spring. 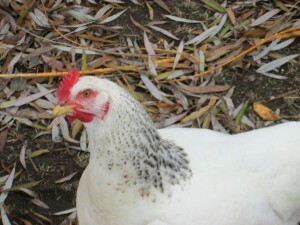 A well know American chicken that is considered one of the most successful of the dual purpose breeds. It’s ability to lay between 200-300 large brown eggs a year, and it’s use as a meat bird, make this an excellent farm chicken. They love to forage and take their role as bug and weed control experts very seriously here at RindyBerry! This breed was developed around the turn of the 19th century. Black Orpington chickens were imported to Australia, andwith egg production as a main goal the Australian breeders made outcrosses to Minorca, White Leghorn, and Langshan chickens. Five primary bloodlines of Australorps were developed by five different breeders and by the early 1920s. The Australorp was officially recognized as a standard breed by the American Poultry Association in 1929. They are only found in one variety (black). 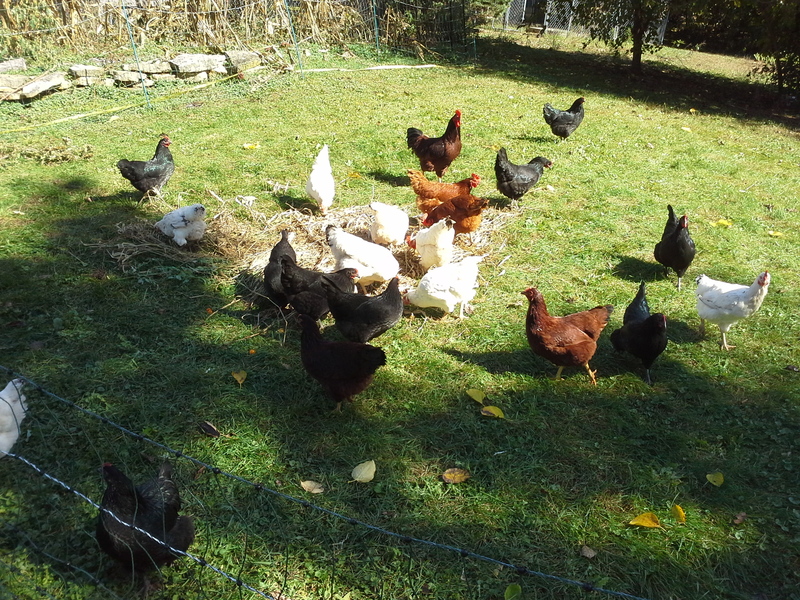 These are a dual purpose bird which are very good egg producers laying a large brown egg. The Wyandotte, one of the original American breeds developed in New York and named after a Native American tribe, is a calm breed noted for its cold hardiness. Their eggs range from light tan to brown and they are also a dual-purpose bird. The bantams are just a smaller version of the standard breed. Because they are such a cute little chicken, we’ve decided to put their coop next to the kitchen garden. They are now my official “garden chickens”.